I've been working on the CtC style sprites for a while,and finally I finally finish somethings so I figured out I should share it to everyone else here to use it. These sprites are free to use for Touhou Danmakufu and other non-profit projects. You can navigate to the respective game's folder for individual sprites, or download entire pack at once. I will occasionally update it and post notification in this thread. Here is the list of the sprites in the folder as of currently. If you have a question,please send me PM or ask in this thread. Feel free to post request here(only official character please), however, there is no guaranteed that I'll do your request. Please note that I don't have much free time,and it might takes a while to sprites something so please do not rush. I always checked comment from time to time, even if I don't reply, please acknowledged that I took note of everything here. All sprites made by me, Kirbio. If you make a Kasen Ibaraki sprite you don't know how happy i'll be (I've always wanted to make a battle with Kasen). Kasen added to first post. After this,I might release some individual sprites before releasing a pack,though not all of them will be released until the pack released. Anyways,there's 2 character left to do before next pack,and next pack will have 6+ characters. By the way,feel free to post request here(only official character please),I might consider doing it and include in next pack,though there is no guarantee,okay? Thanks! It's okay that the Eagle couldn't be made. I've got a ton of requests, actually (You OBVIOUSLY don't have to do them all quickly). Oh. I've never seen a download for them bold ones before, or anything. I also haven't seen a Wriggle sprite EVER. Actually I made that(though I found the first frame somewhere else in coolier,then made all animation myself). I can't release it yet because I don't have enough sprites to release in pack. Though she'll be definitely in the pack 3-the wandering youkai set(with Wakasagihime,Sekibanki,Letty,and another 2 random youkai I haven't decided). Pack 2 is nearly finished,it's the "musician pack"- Prismrivers,Tsukumos and Raiko. Hm, perhaps you could make Layla with this, too? If it's okay, I would like to request Yuugi and possibly Miko (ULiL/HM). The only Yuugi I've seen is that one sprite from the Seija fangame. Back with a Request. Could you make Elly (TH04) with her Scythe? These came from Spell Card Records, if you're wondering. I -think- the guy who made all the other character sprites made these, but it's hard to tell because these seem like they have a rather large drop in quality compared to the others. To clear up some confusion,yes they originally exist,Prismrivers too. Prismrivers are only in just 1 frame,and made by Nyagakiya,the official spriter who do CtC sprites and release in coolier site,I'm extending it to full sheet with animation. The DDC Musician sprites in the link is from Spell Card Records,the sprites(and script) was made by Dolltrail. Though I didn't like that sprites much,so I redone it again,even it's existed before. Here's the preview of the sprites,as well as compared to the already existing version,do not take anything from here though,it isn't finished yet. I am currently get caught up with my works at the moment,if I have some free time,I'll finish the last two Tsukumos sprites sheet as fast as I can. I have a full sheet for the prismrivers. that exists too, xD, but its not that good, i should admit. Could you make a Kurumi sprite? I've been hoping for one for danmakufu. Is Kurumi an official touhou character? Second stage boss of LLS, which is a pc-98 Touhou game. 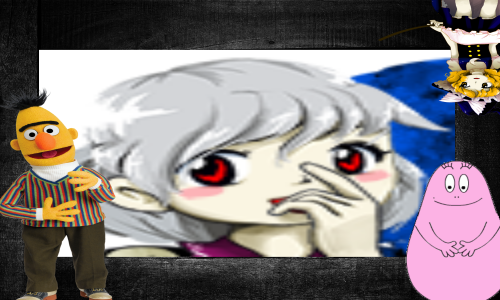 Hey, I was wondering, could you make a Yoshika sprite for me, please? I apoogize if this is necroposting (I don't think it is, though). I'm not sure if you're still taking requests, but if you are, could you make Keine and/or ANYONE from Mountain of Faith (or point me in the direction of existing sprites)? The only ones I've seen are for Aya and Sanae. I'm back,sorry that the Pack2 has been take longer time than I expected it to be,but it's here now. As an apologetic gift for taking longer time than usual,I presented you some more sprites picked from some request here. For others,don't worry! I'll slowly doing one by one! Here's Yoshika. I also added Seiga as a bonus. 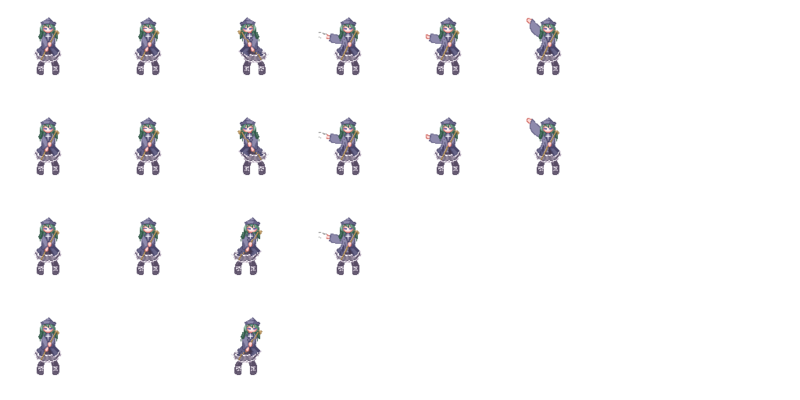 There are sprites for Kanako and Suwako as well,I won't post it here as it wasn't made by me but I'll sent you via PM. The First Post also updated with new sprites here and in the Pack 2 as well. Thanks a bunch! I didn't realise ISCR was a playable game; I'll have to look it up when I get home. Minor Update: The Preview Video for Pack 2 is up. My gosh, prismriver sisters, tsukumo sisters, and raiko! ?